Christchurch Mansion & Art Gallery. The mansion stands on the site of the Augustinian Priory of Holy Trinity, founded c. 1177. Perpendicular fragments of the priory buildings are exhibited in the mansion. The buildings were purchased shortly after 1545 by Paul Withipoll, who built the house in 1548-50. It was extended in 1564. E-plan, red brick, blue brick diapering. Two storeys. Upper Storey rebuilt c. 1647 after a fire. 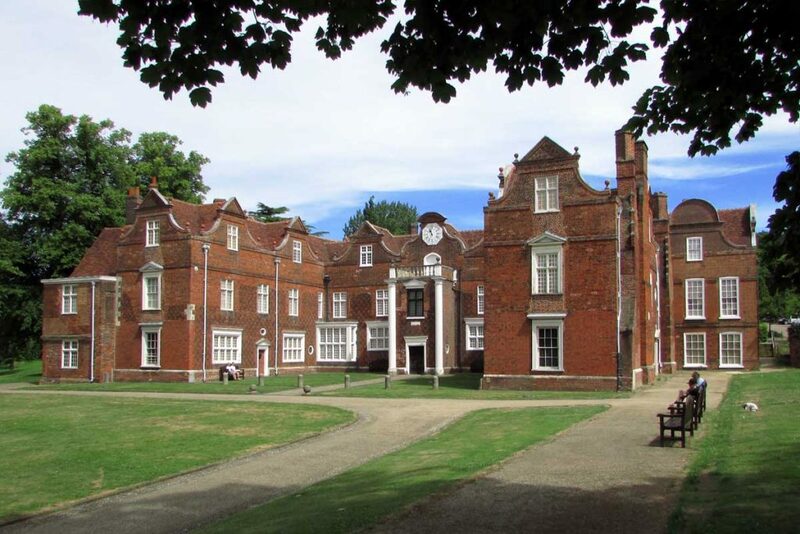 Christchurch Mansion, is set in the 33 hectare Christchurch Park, just five minutes walk from the town centre. It features period rooms from the sumptuous Georgian Saloon, to the more humble Victorian wing with its displays of children’s toys and dolls houses as well as the biggest collection of paintings by Gainsborough and Constable, outside of London, along with collections of other artists inspired by the beautiful landscapes of East Anglia.